There are still some segments of society hung up on the issue of ending cannabis prohibition due to an unfounded fear that the seed-bearing plant is somehow a “gateway drug” that leads to a life of vice and crime. But the real gateway substances that we should all be worried about, and perhaps the ones with the most negative impact on society, are pharmaceutical drugs, and antidepressants like SSRIs (selective serotonin reuptake inhibitors) in particular, which have been proven to lead to extreme depression, suicide and even mass murder. 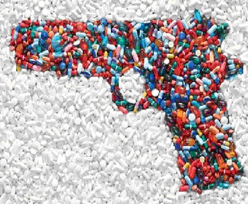 One of the more recent drug-induced mass shootings, which took place at Fort Hood in Texas, was also linked to SSRIs, though the mainstream media has been reluctant to name which ones. An all-too-familiar scenario, the shooter had reportedly been taking the medications when he suddenly decided to go on a violent rampage, killing everyone in sight before finally turning his weapon on himself for the final kill. When horrific events like this occur, their connection to pharmaceuticals is routinely downplayed, almost as a matter of policy. It is apparently better to just keep things quiet in order to protect the drug companies, while millions more of our children are prescribed a class of drugs that has the potential to permanently alter their brain chemistry and cause them to commit these and other violent acts. According to David Healy, author of more than 150 peer-reviewed papers in the field of psychiatry, as well as the author of several books, SSRIs are responsible for triggering some 4,000 additional suicides annually in both the U.S. and Europe. This figure is based on clinical trial data that Healy gained access to that was never publicly released, but of which drug companies are fully aware. Besides not having to release this information publicly under existing law, drug companies are also able to cover up SSRI-induced suicides by having these suicides classified as other forms of death. In some cases, coroners will declare obvious suicides as accidental deaths, for instance, which in the greater scheme of things makes it appear as though drug-induced suicides are far less frequent than they actually are. “You look at deaths where SSRIs have been involved, and case after case after case you see the coroner saying, ‘Well, you know, he hanged himself, but we can’t be sure that it was deliberate.’ What?” asks Julie Wood, one of the proprietors of SSRIStories.org, a repository of cases of SSRI-induced harm and death. Be sure to watch the full video report by The Corbett Report on SSRIs and mass killings here: http://www.corbettreport.com.